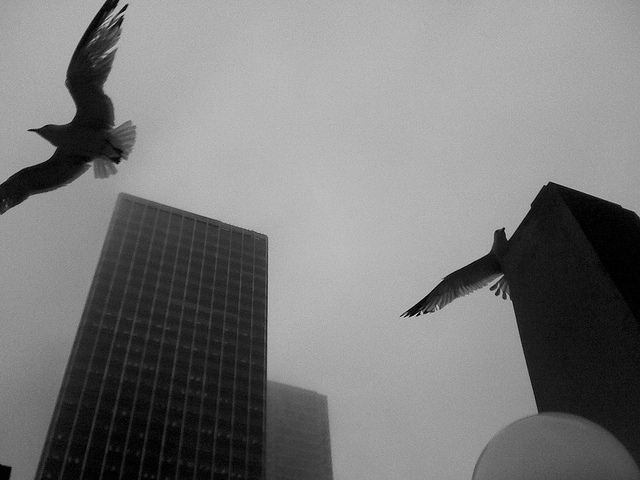 Birds flock near the Chicago River, Clark Street and Wacker Drive. Chicago's skyline kills more birds than any other in the country. Design firm Gensler used a pixelated bird pattern frit on the facade of 618 S. Michigan Ave. Detail on the bird pattern frit at 618 S. Michigan. When Columbia College called on Gensler to restore a historic Michigan Avenue façade, the design team put a bird on it. They had previously discussed Chicago’s problem with bird collisions — due to the city’s location amid many major migratory routes, Chicago’s skyline kills more birds than any other in the country — but abandoned the idea of plastering a classic Michigan Avenue address with conspicuous bird decals. 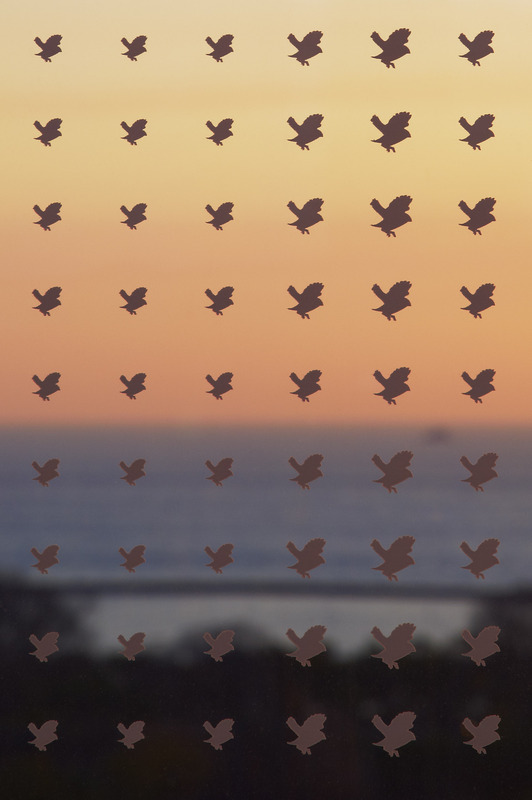 Instead of dots and lines comprising the frit pattern, they asked, what about stylized bird pictograms? “At first we were just playing with it, but it turned out to be a really functional, practical way of depicting the image of the old building,” said the firm’s Chicago design leader Elva Rubio. The goal, Rubio said, was to create an abstracted “ghost” image of the building’s original terra cotta facade using a pattern of pixels. “Your eye doesn’t even catch the bird,” Rubio said. But they hope the pattern will catch the eyes of migrating birds. 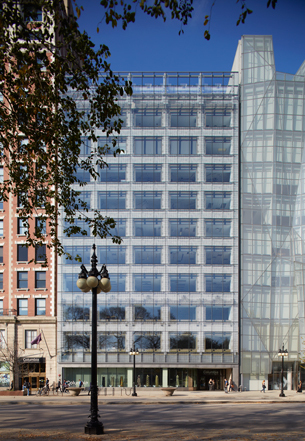 Gensler’s own windows in the nearby Carson Pirie Scott building served as the test kitchen, playing host to more than 50 mock-ups refined using a computational program developed in-house. As “the nation&apos;s largest landlord,” the GSA could make a dent on the considerable problem of bird collisions. The American Bird Conservancy estimates between 300 million and one billion birds, both resident and migratory, die each year after hurtling into buildings. Quigley’s office said birding generates some $4.4 billion in federal tax revenues, and is responsible for roughly 670,000 jobs. The new bill, which follows an ill-fated 2011 measure by the same name, has been deemed cost-neutral by the Congressional Budget Office. When he was a Cook County Commissioner, Quigley sponsored legislation in 2008 that codified bird-friendly building guidelines. Quigley, who taught environmental policy at Loyola University and bikes to work at the Capitol, recently gained a seat on the influential House Appropriations Committee. “I’m in a good position to help at the worst possible time,” he told scientists at the Chicago Botanic Garden during a “climate tour” of the Chicago area earlier this month. Climate science deniers have obstructed environmental legislation, he said, so far squandering Congress&apos; chance to address the global problem through legislation. As Lori Rotenberk wrote for Grist, birds appear to be migrating sooner and even getting smaller — possibly adaptations to global warming. The source of that data? A library of bird carcasses recovered by the Chicago Bird Collisison Monitors. Chris Bentley writes about the environment for WBEZ. Follow him @cementley.